Received: October 4, 2018; Revised: October 24, 2018; Accepted: October 29, 2018; Published online: March 15, 2019. Fig. 1. 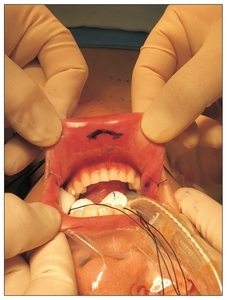 Intraoral incision sites. Fig. 2. Docking of the robotic system. Wilhelm T, Metzig A. Endoscopic minimally invasive thyroidectomy (eMIT): a prospective proof-of-concept study in humans. World J Surg 2011;35:543-551. Nakajo A, Arima H, Hirata M, et al. Trans-Oral Video-Assisted Neck Surgery (TOVANS). A new transoral technique of endoscopic thyroidectomy with gasless premandible approach. Surg Endosc 2013;27:1105-1110. Anuwong A. Transoral Endoscopic Thyroidectomy Vestibular Approach: A Series of the First 60 Human Cases. World J Surg 2016;40:491-497. Chai YJ, Kim HY, Kim HK, et al. 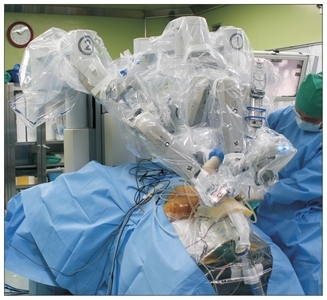 Comparative analysis of 2 robotic thyroidectomy procedures: Transoral versus bilateral axillo-breast approach. Head Neck 2018;40:886-892.